Making huge profits with a small list is possible! My name is Connie Ragen Green, and I’ve been making a full time living online since 2006. I have successfully built a five figure a month income with a very small list. In fact, I was earning six figures a year long before I had one thousand people on my list, and I can teach you how I did this by following some simple marketing strategies based on affiliate marketing, product creation, and joint ventures. I am now a list relationship coach, helping others to build a relationship with the people on their lists in order to increase their online income. Even though it is important to be continually growing your list, you certainly do not need a huge list in order to make an excellent living with your online business. Thanks for being here, and be sure to sign up on the right to receive an email notification when I write a new post twice each week. Feel free to leave a comment on any post that resonates with you, and share your own experiences about making big money with a tiny list. I have completed my first book, Huge Profits With A Tiny List: 50 Ways To Use Relationship Marketing To Increase Your Bottom Line, and it is now available. Click on the picture of the book on the right to get your copy today, or visit Amazon.com directly to see what else I have available. My latest books are now available. The titles are Huge Profits With Affiliate Marketing: How To Build An Online Empire By Recommending What You Love and The Inner Game of Internet Marketing, co-written with author Geoff Hoff. Click on the link on the right, or visit my author page on Amazon or Barnes & Noble to order your copy today. 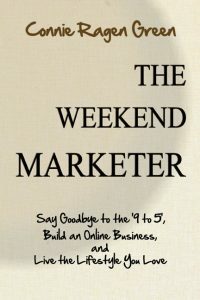 Finally, The Weekend Marketer, is available! I spent almost a year creating this book and online course based on the principles and strategies I used to make the jump from working as a classroom teacher and real estate appraiser to coming online full time in 2006. You can do the same thing, and I’m here to assist you. No matter where you are right now, the Weekend Marketer™ book and program will help you to achieve the success you want and deserve. It is my hope that you will join me on your journey of turning your ideas, interests, and passions into a lucrative online business.